It turns out the James Honderich’s thesis is actually a summary of polar bear harvests in Canada from about 4,000 years ago to 1935. The number of polar bears taken by Arctic explorers (1594 to mid-1900s), Hudson’s Bay Company fur traders (from 1670 to 1935) and Arctic whalers (1820s-1935) were calculated from a variety of historical sources. This post is a summary of the results for the period 1800-1935. It is likely you have never seen this astonishing information before and the implications for polar bear biology are substantial. Polar bears harvested by Arctic explorers were estimated by Honderich from information in published journals. Harvests by fur traders were taken from journals written by the managers (“factors”) of Hudson’s Bay Company trading posts, plus fur ledgers, fur sale books and similar documents. Numbers of polar bears killed or taken in trade by whalers were tallied from a subset of whaler’s journals (66 of them). Polar bear biologist Ian Stirling is listed (pg. 24) as one of four reviewers of Honderich’s thesis. So I went back to Stirling’s new (2011) polar bear book (which I recently reviewed here) and lo and behold, found an excellent summary of Honderich’s work on pgs. 246-247 that I had missed [as I said in my review, there is a lot of good stuff in Stirling’s book – too bad it is marred by Stirling’s willingness to leave out critical facts to make his advocacy statement appear better supported.] So I was able to use Stirling as an additional resource for this review. 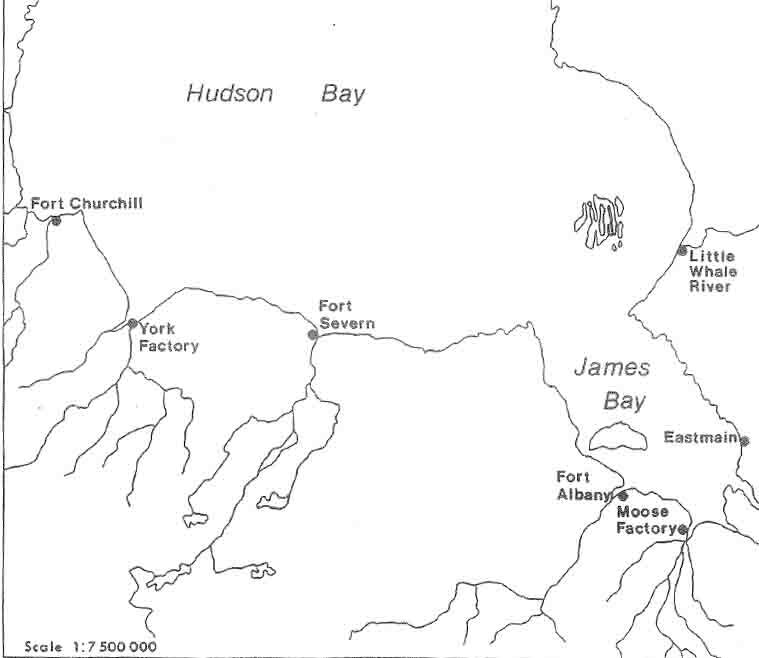 Below is a map of Hudson Bay (from Honderich’s thesis) with the forts established by the Hudson Bay Company (major fur traders in Canada) marked, just to get you geographically oriented. Figure 1. [Honderich fig. 4.1, pg. 72]. which operated from 1717 to the 1930s. Port Churchill and York Factory were adjacent to denning habitat used by large numbers of pregnant female polar bears of western Hudson Bay. 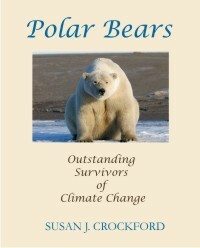 The take-home message from Honderich’s study is that explorers had a negligible effect on polar bear populations, as did Inuit hunters, since both of these groups took polar bears primarily for food and clothing. Fur traders had more of an impact, especially in the Churchill area of western Hudson Bay. But it was the whalers who had by far the largest impact, especially in the period 1890 to 1930, in the eastern and central Canadian Arctic. After at least a century of concerted effort to remove as many bowheads as possible from Canadian waters (starting in 1820 in Baffin Bay, pg. 95), whalers increasingly sought seals, beluga and walrus for their oil, and polar bears for their skins, in order to boost their revenues. Figure 2 below shows the relative proportion of polar bears harvested annually by three different groups of hunters in the Canadian Arctic calculated by Honderich. The scale on the left goes to 800. 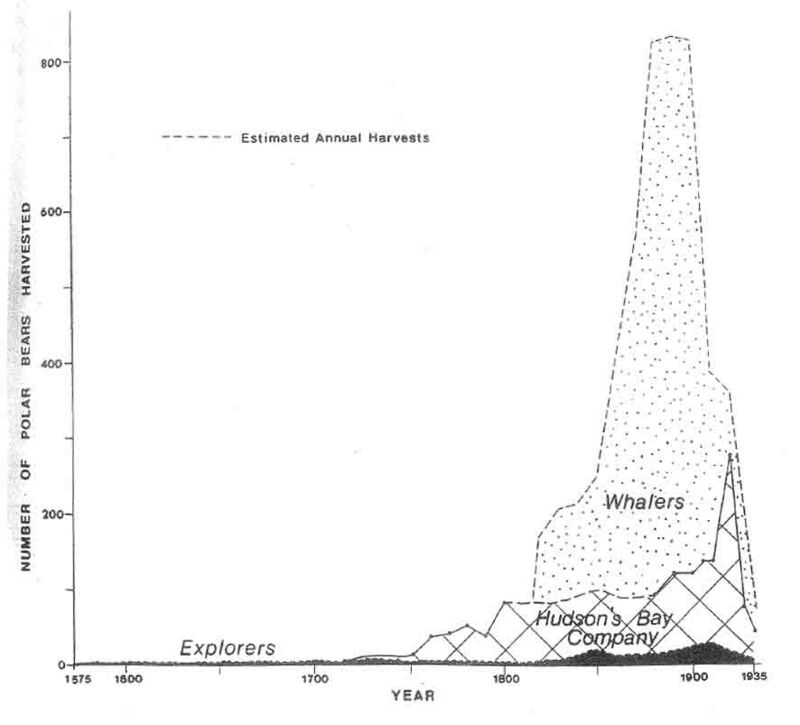 Note this figure shows annual harvests from all Arctic regions, including a small contribution from the Beaufort Sea whaling fleet (mid-1800s); “Hudson’s Bay Company” harvests are primarily from the eastern Arctic plus Hudson Bay, and harvests by “whalers” includes bears traded from Inuit hunters, primarily at whaling stations established on shore. Click to enlarge. 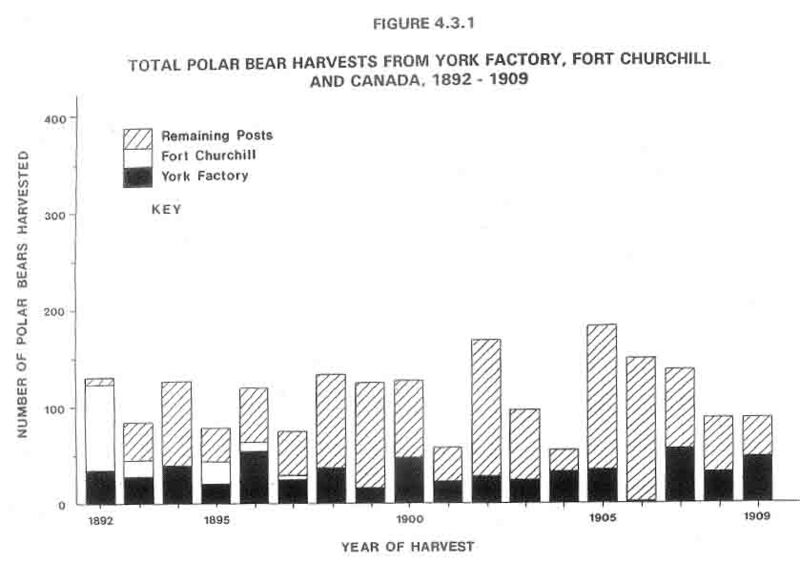 At Fort Churchill and York Factory during the same period, Honderich found that aboriginal hunters engaged in trade (including Chippewa, Cree and Caribou Inuit) and fort employees together took an average of 37 polar bears/year from 1890-1929, for a total of > 1,500 bears (pg. 90). The annual harvest quota for western Hudson Bay in 1991 was 55 bears/year, so in comparison to the earlier period, it seems that the Hudson’s Bay Co. traders by themselves were not taking remarkable numbers of polar bears. See the numbers by year in the two graphs below (figs. 3 and 4). Annual harvests from Hudson’s Bay Company posts, 1892-1909. Almost all of these were in Hudson Bay, see Fig. 1 above. There was one post in the western Arctic with polar bear harvests that are included in “remaining posts” but the amounts are negligible. Click to enlarge. Figure 4. [Honderich’s fig. 4.3.2, pg 81]. 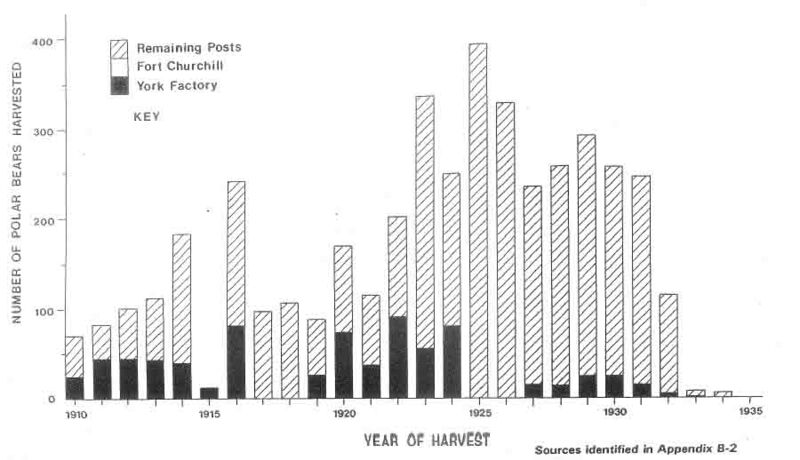 Annual harvests from Hudson’s Bay Company posts, 1910-1935. As a consequence, if the 1890-1929 harvests included similar proportions of cubs and females as earlier harvests, 37 bears a year (average) taken by HBC traders may have been enough to negatively impact the western Hudson Bay population into the 20th century. However, it was the whalers, operating over the same time period in Hudson Bay, that seriously impacted polar bear numbers, compounding the effects that fur traders were having. For example, just one whaling ship, the Active, took the following numbers of polar bears from Hudson Bay between 1899 and 1908: 1899 – 34; 1901 – 76+ ; 1903 – 46; 1904 – 32; 1908 – 100. The map below (fig. 5) shows the whalers routes and approximate times they started operating. Figure 5. [Honderich’s fig. 5.1, pg. 96.] 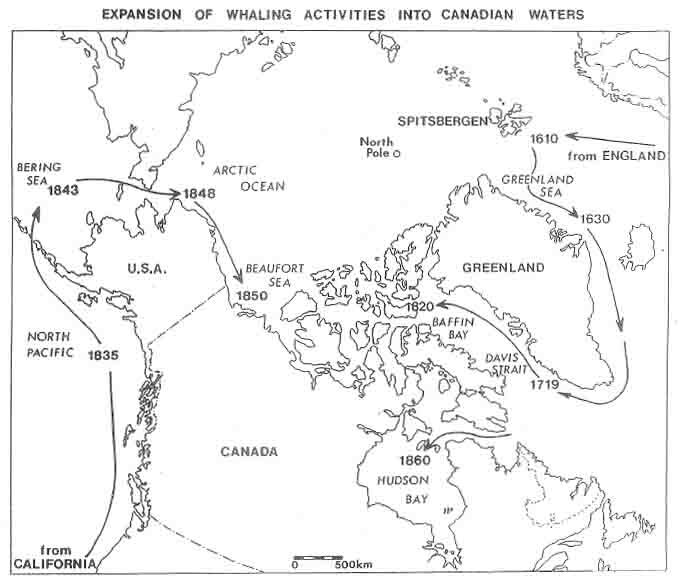 A summary of whaling routes (and dates) taken in the Arctic Canada. The polar bear subpopulations (as defined today) most heavily impacted by whalers were those in Davis Strait and Baffin Bay in the east and Western Hudson Bay, Southern Hudson Bay and Foxe Basin in the central region. Based on these numbers, it appears very likely that the intense period of whaling activity from 1890-1920 was enough to reduce polar bear populations in Davis Strait significantly. The combination of whalers plus fur traders operating on Hudson Bay must have had the same effect on western Hudson Bay bears. But what about the rest of the Arctic? How do Canadian records compare with other regions for that period? So, 60-65% of 150,000 is 90,000-97,500 polar bears taken in Svalbard since 1700, of which Stirling accounts for about 22,000 in the most intensive harvesting period known. He also says that up to 200 bears/year were taken from 1700 to 1800, so that’s another 20,000 but there’s still many bears unaccounted for. Were those “peak” years 1908-1923? If so, 15 years of 1,400 bears/year adds another 21,000 animals harvested, which gets us closer to the 150,000 total given by Uspenski and corroborates the statement by Honderich that harvest levels were similar to Canada’s. Why would Stirling leave that out? No small wonder then, that Russia was the first Arctic nation to completely prohibit the killing of polar bears, a rule enacted in 1956. Enforcement of that rule, however, was (and probably still is) another issue altogether. All that said, what do official polar bear documents say about this history of intense commercial harvest? That’s a lot of history ignored, unless they are referring only to the USA. But you’d think the earlier carnage wrecked by commercial hunting by whalers and fur traders in Canada and Russia might have warranted at least a sentence for the sake of completeness. 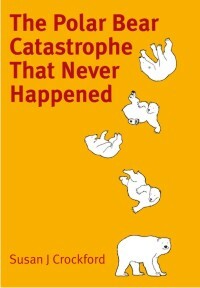 Canada lost a lot of bears, how do they handle this? The 2008 COSEWIC report on the status of polar bears makes no mention of pre-1930s harvests. Regarding international reports, none of the fifteen Polar Bear Specialist Group meeting reports (1965-2009) mention the intense harvests of the late 1800s to early 1900s – not that I could find. Ironically, Stirling’s new book stands out in this regard. Kudos to him for that, except for some of the details left out. For one thing, it gives us some idea of how large pre-20th century polar bear populations must have been, although it still doesn’t give us a number comparable to modern counts. However, it is pretty clear that before hunting by whalers intensified in the 1890s, polar bear populations must have been considerably larger than they are now. I conclude this based on the fact that even after mind-boggling numbers were taken annually by whalers and traders in the 40 years prior to 1930 in Svalbard and Hudson Bay, there were still enough polar bears remaining after WWII for significant numbers to be taken annually by sport hunters. Actually, the question I would ask is, why was a population decline not apparent before the sport-hunting started? Sport-hunting for polar bears really took off between 1945 (after WWII) and 1970 (when 320 bears every year were being killed around Svalbard), but this came just after almost half the current (2009) population estimate of 2650 bears in the Barents region had been killed every year for fifteen years straight (say 1,000/yr or so, from 1908-1923 ) in that region. Why did Larson not mention the horrific overharvest that took place in the first three decades of the 20th century? Did he really not know? It sounds to me like there had to have been a hell of a lot of polar bears in the Barents Sea around Svalbard in the late 1800s for that intensity of harvest, perpetrated over 80 years, without a serious decline became patently obvious much sooner than the 1950s. My calculations, based on the Honderich and Uspenski figures, suggest that more than 60,000 polar bears were harvested in the 40 years between 1890 and 1930 from three areas alone: all of Hudson Bay, Davis Strait and Svalbard combined (assuming about 30,000 taken by whalers plus 1,500 by fur traders in Canada plus about 30,000 taken in Svalbard). As Honderich suggests, the actual numbers are probably higher rather than lower (for Canada at least, probably for Svalbard as well). Modern annual harvests (using 1993 PBSG report figures, Wiig et al. 1995) from these three areas have been about 150 bears/year, which would be about 10,000 over 40 years (zero for Svalbard/Barents, bears there are fully protected). This means that before the intense sport hunting of polar bears (from about 1930 through late 1960s) had even begun, at least 6x as many bears per year had already been removed as are now taken from these regions. This subset of modern harvests come from a global population estimated at 20,000-25,000 bears (Obbard et al. 2010)]. That does not mean the pre-harvest population was 6 times as large as it is now, but it is an indication that many more bears must have existed in the 1800s than exist now. So when polar bears first began to be studied seriously in the 1970s and 1980s, at least two out of the three subpopulations that were heavily affected in the early period (1890-1930s) as well as the later one (1940s-1960s) – western Hudson Bay and Svalbard – had to have been in “population recovery” mode, biologically speaking, a natural response to the 80 year assault by whalers and traders and sportsmen. Surely that was taken into account in terms of interpreting data collected from those populations, such as cub production? However, we see no discussion of this in the literature. For example, in their paper on polar bear research in western Hudson Bay from 1966-1992 (what could reasonably be called the “recovery period”), Derocher and Stirling (1995:1662 ) have this to say: “Throughout the 1950s, 50-100 polar bears, including many adult females with cubs, were harvested annually.” and later “…we suspect that the population size was markedly reduced by the late 1960s.” Not a mention of the earlier carnage wrought by whalers and fur traders in the 1890-1930 period, which by 1995, Stirling was well aware. Perhaps he thought it was irrelevant? The second reason that this information on historical overharvesting is important is that an 80-year-long decimation of polar bears, virtually world-wide, may have markedly reduced the genetic diversity of polar bears living today. This fact is almost certainly critical to polar bear geneticists trying to unravel polar bear population dynamics and evolutionary history but it appears they are not aware of this phenomenon. I am almost certain that polar bear geneticists have no idea that such a population decline occurred. Certainly, if they had consulted the polar bear status reports prepared by US Fish and Wildlife, COSEWIC, or any of the PBSG meeting reports (as well they might, for an “official” overview), as discussed above, they would have been none the wiser. For example, I had another look at the paper published by Paetkau and colleagues in 1999, one of the first large-scale studies on polar bear genetics (for which Ian Stirling was a co-author). Paetkau et al. (1999:1573) mention only the 1960s overharvests as leading to cause for international concern over polar bear numbers, citing the 1st PBSG meeting report (1965). More recently, the polar bear evolution paper by Miller et al. 2012 (discussed previously here and here) talks extensively about population declines but fails to mention the significant human-perpetrated decline in polar bear numbers that occurred between 1890 and 1970. In summary, commercial whalers and fur traders slaughtered a huge number of polar bears world-wide, especially between 1890 to 1930, when more than 60,000 bears were harvested over a 40 year period. Polar bears share this history with many other marine mammals – they are not unique in that respect. 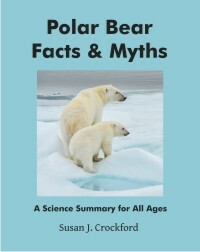 However, in contrast to those other species, the modern literature on polar bears is largely silent about that black period of its history (except for Stirling 2011), to the detriment of modern polar bear research. It is hard not to wonder why that is the case. Honderich, J.E. 1991. Wildlife as a hazardous resource: an analysis of the historical interaction of humans and polar bears in the Canadian arctic. MA thesis, University of Waterloo, Ontario. Miller, W., Schuster, S.C., Welch, A.J., Ratan, A., Bedoya-Reina, O.C., Zhao, F., Kim, H.L., Burhans, R.C., Drautz, D.I., Wittekindt, N. E., Tomsho, L. P., Ibarra-Laclette, E., Herrera-Estrella, L., Peacock, E., Farley, S., Sage, G.K., Rode, K., Obbard, M., Montiel, R., Bachmann, L., Ingolfsson, O., Aars, J., Mailund, T., Wiig, O., Talbot, S.L., and Lindqvist, C. 2012. Polar and brown bear genomes reveal ancient admixture and demographic footprints of past climate change. Proceedings of the National Academy of Sciences 109:E2382-E2390. Obbard, M.E., Theimann, G.W., Peacock, E. and DeBryn, T.D. (eds.) 2010. Polar Bears: Proceedings of the 15th meeting of the Polar Bear Specialists Group IUCN/SSC, 29 June-3 July, 2009, Copenhagen, Denmark. Gland, Switzerland and Cambridge UK, IUCN. Paetkau, D., Amstrup, S.C., Born, E.W., Calvert, W., Derocher, A.E., Garner, G.W., Messier, F., Stirling, I., Taylor, M., Wiig, O., and Strobeck, C. 1999. Genetic structure of the world’s polar bear populations. Molecular Ecology 8:1571–1584. Schliebe, S., Evans, T., Johnson, K., Roy, M., Miller, S., Hamilton, C., Meehan, R., Jahrsdoerfer, S. 2006. Range-wide status review of the polar bear (Ursus maritumus). US Fish and Wildlife Service, Anchorage, AK. Wiig, O., Born, E.W., and Garner, G.W. 1995. Polar Bears: Proceedings of the 11th meeting of the Polar Bear Specialists Group IUCN/SSC, 25-27 January 1993, Copenhagen, Denmark. Gland, Switzerland and Cambridge UK, IUCN. This entry was posted in Population, Uncategorized and tagged commercial harvest, Davis Strait, fur traders, genetics, Honderich, Hudson Bay, Stirling, Svalbard, Uspenski, whalers. Bookmark the permalink.